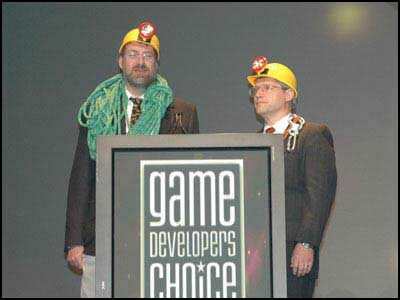 At the Developers Choice Awards at the 2006 GDC, Steve and Bob Bates were given a very special honor: to present the First Penguin Award to Don Woods and Will Crowther, creators of the original Adventure. The First Penguin Award acknowledges developers who dive head first into unknown territory, leading the way for the rest of the development community. 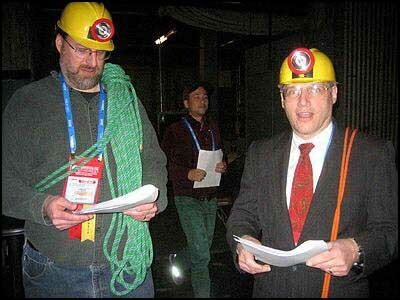 In order to properly honor the cave-setting of Adventure (and also to never miss an opportunity to be very silly), Bob and Steve dressed up in full spellunking gear. Unfortunately, Will wasn't able to make it, but Don was there and it was a great to meet half of the team that had such a huge impact on my own career and on the entire game industry. BOB: The First Penguin Award is given each year to those who were the first to jump into dangerous waters, uncertain of success or failure. These developers and their journey serve as a lesson and an inspiration to our community. STEVE: If it weren’t for tonight’s recipients of this award, I would probably still be a construction project manager, Bob would probably still be a tour guide in Washington D.C., and a lot of the people in this hall would also being doing something a whole lot less fun. BOB: When we speak of first person shooters, we don’t refer to them as Wolfensteins. When we talk about God games, we don’t say Populouses. When we refer to arcade games, we don’t call them Pongs. STEVE: But there is one game genre where the progenitor was so revolutionary, so unique, so memorable, it gave its name to the entire category. I’m referring to adventure games. BOB: This year’s First Penguin is being awarded to the creators of Adventure, the first of its kind, an interactive fiction text game created in 1976 by Will Crowther's impressive imagination and expanded by Don Woods' programming prowess a year later. 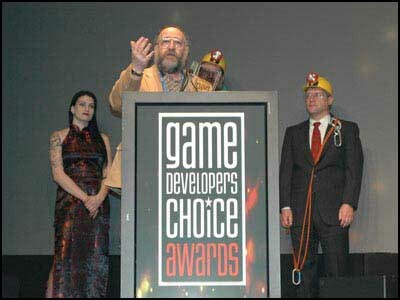 STEVE: Will, an ardent cave explorer and programmer, developed the game for his young children, based on his spelunking trips to Mammoth Cave in Kentucky. He shared his “maze of twisty passages” with friends, word spread, copies were shared – and the program ended up on a computer at Stanford University. BOB: Don, who was a Ph.D. student at the time, became intrigued by the game. He expanded the game greatly and then opened it up to other players through an early precursor of the Internet. STEVE: Little did Will and Don know that their program would revolutionize our industry and give birth not only to the adventure genre, but to story-telling elements in virtually every type of interactive gaming. Unfortunately, Will was not able to join us this evening, but without further ado, please help us welcome to the stage one of this year’s First Penguins, Don Woods.